A pioneer in decorative heating, Rasmussen leads the way with alternative media sets made from the finest quality refractory ceramic materials. The ALTERNA FireBall set is sure to add a touch of modern flair to any home. Rasmussen uses a carefully designed burner system to produce the most appealing display in decorative appliance presentation. The Vent-Free burner comes with a factory installed ODS system and has a BTU output of 40,000 BTUs. This set features a pre-installed basic variable flame height safety pilot valve that is operated by a switch or the included remote control. 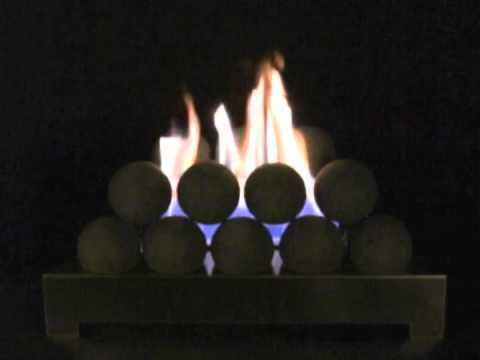 Let this ALTERNA FireBall Set from Rasmussen bring the elegant beauty of a contemporary fire system into your home. Set Includes: 15 Natural FireBalls, ANSI Certified Vent-Free Black Chassis Burner, Oxygen Depletion Sensor (ODS) pilot, piezo ignitor, connector kit, and instructions.